my talented neighbor did not disappoint with her family cake. She did the Angry Birds cake and the spaghetti and meatballs cake here. 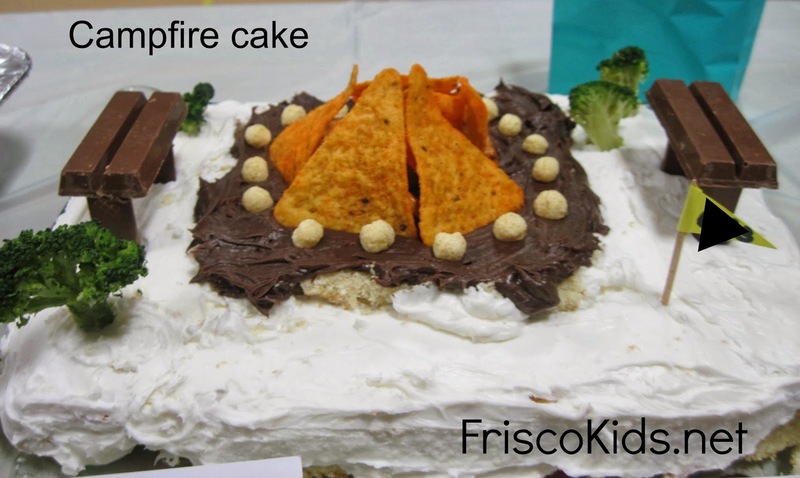 The theme this year was "Fire and Icing" and it was a chili cook-off in addition to the bake-off. 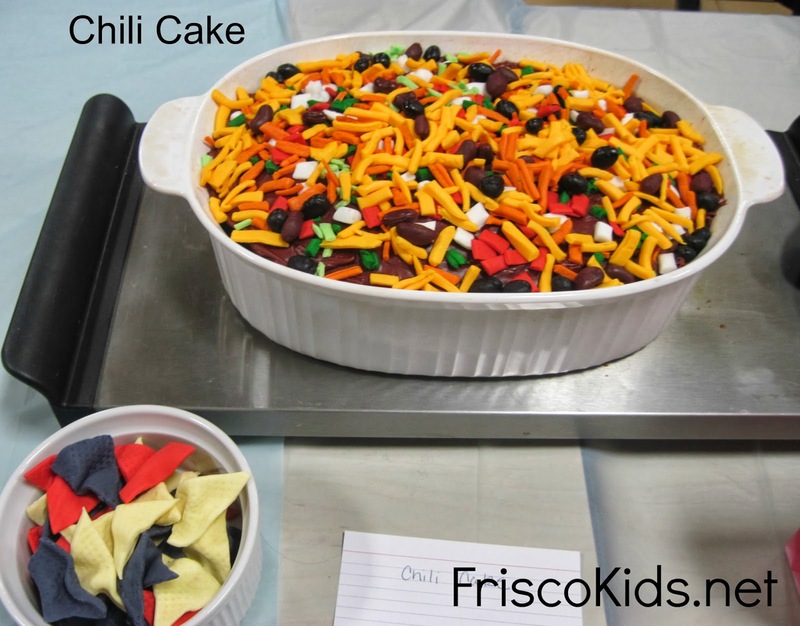 Leave it to my clever neighbor to do a chili cake, which looks like it's actually on the warmer! Believe it or not, all the decorations on top are fondant, colored separately and rolled into shapes. Including the tri-colored tortilla chips. The kids helped with that part. 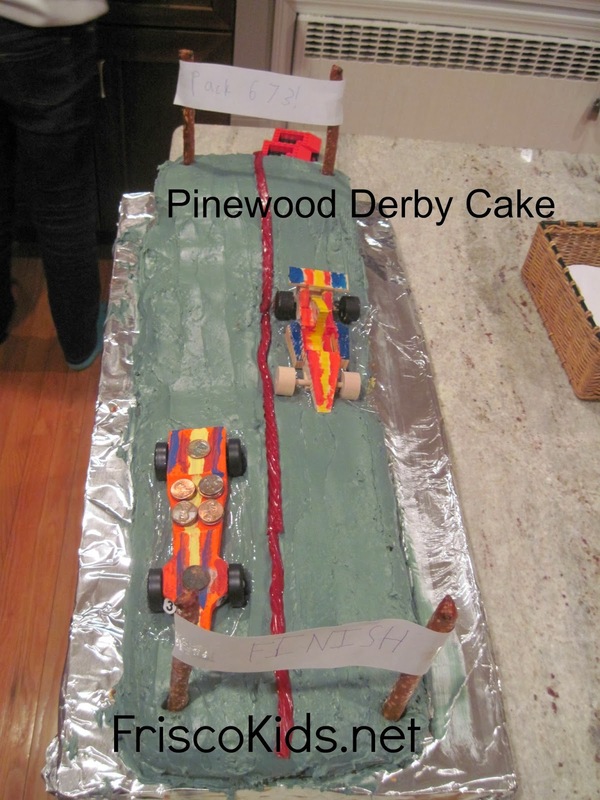 Not surprisingly, they won the "most creative" hands-down. 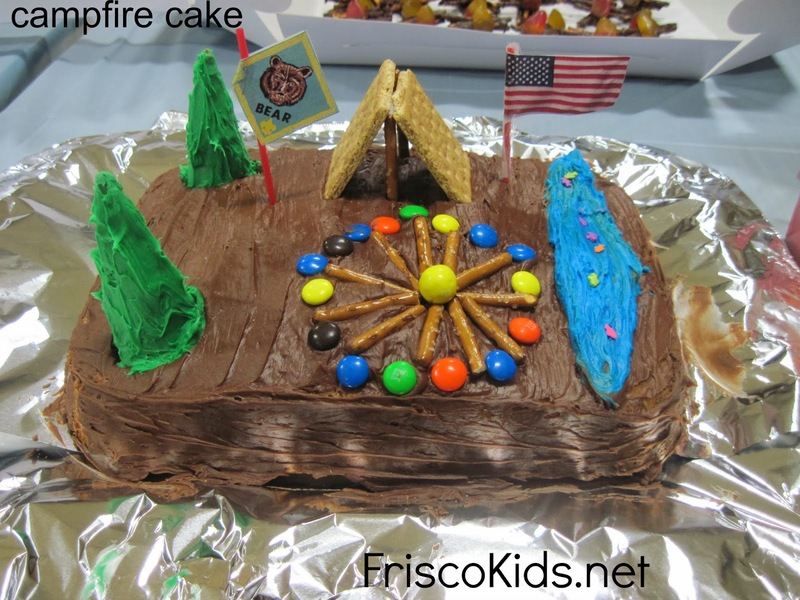 Here you can see the awesome competition with many cakes using a campfire and camping theme. I think the cakes were all amazing. 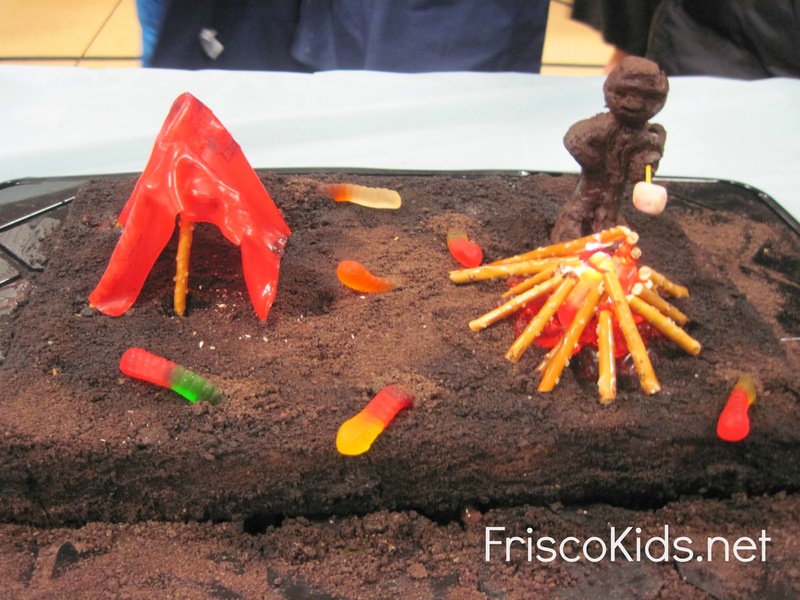 I love seeing how people create what looks like camping things, with candy and food. The guy above was melted into a chocolate chunk, and the scout carved him. That's a real scout! Under the dirt is a giant blondie. I love the tent made out of fruit roll-up. You can't quite see it, but the fire has a small battery operated light underneath, covered with more roll-up. It was adorable and clever. 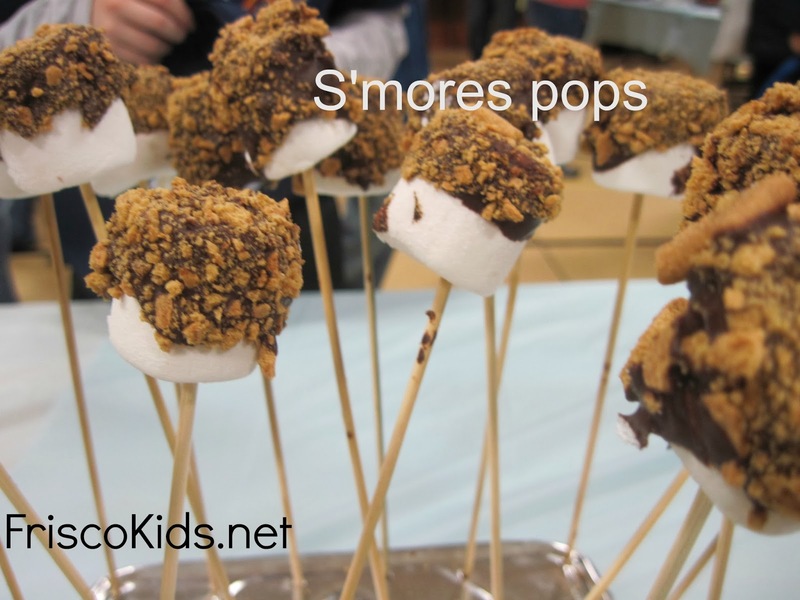 These s'mores pops were one of the first things to disappear once we were allowed to eat. I know because our cake was next to it, and the kids were grabbing these left and right. 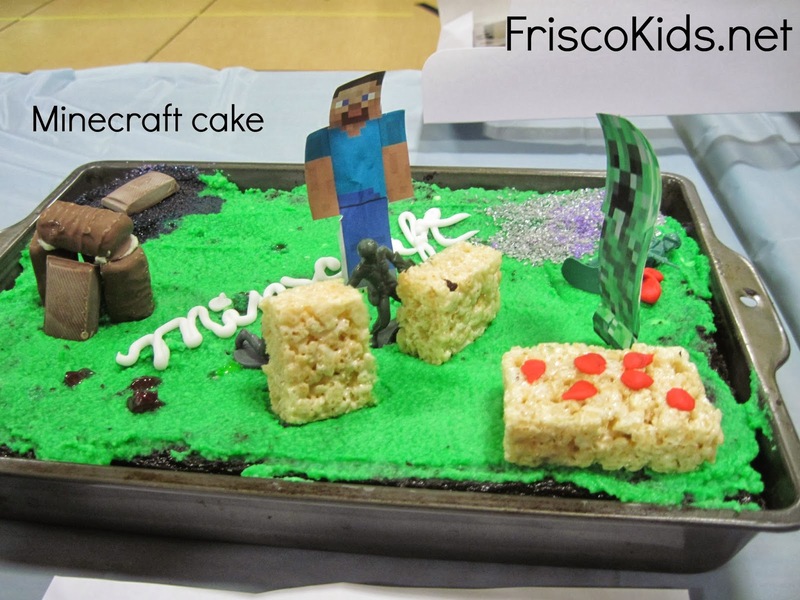 Going with the kid-theme of the year, this was one of two Minecraft themed desserts. 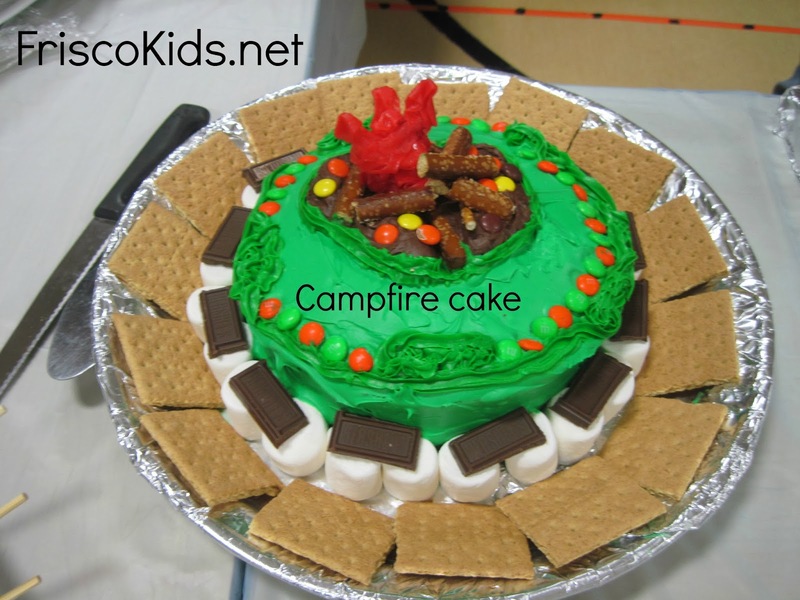 More campfire themes. I like the Bear flag, and the trees made out of frosting. And the campfire is clever too. 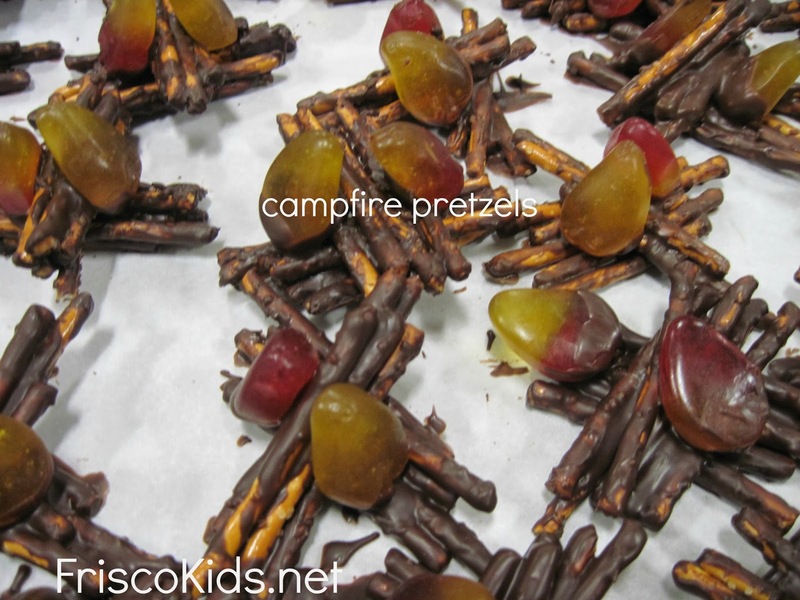 These campfire pretzels were so cute, using gummy candies for the fire. 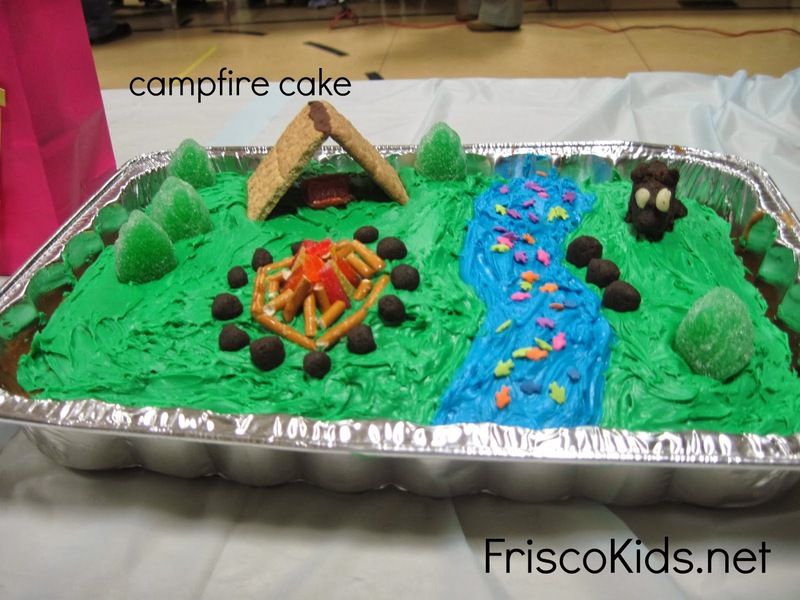 Another cute camping theme, with gumdrop trees and a bear in the woods. 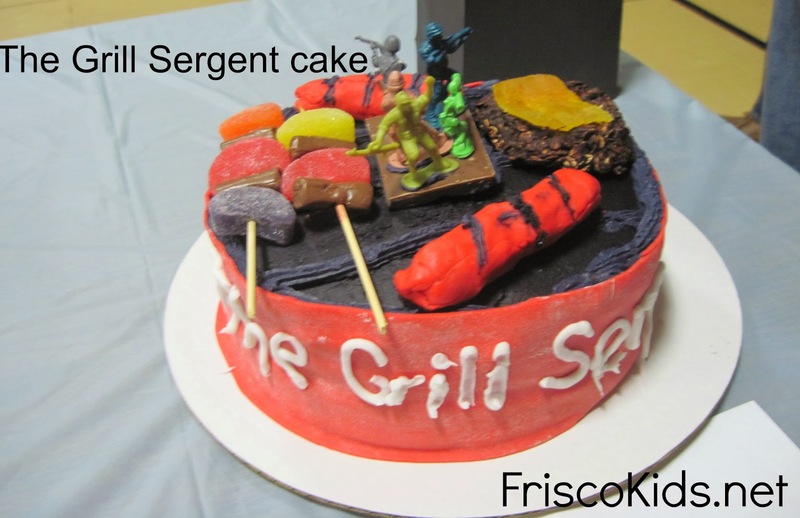 I voted for the Grill Sergeant for most patriotic, because I really liked the top. Another great campfire, using Doritos for the fire, and KitKats for the benches. And broccoli for trees. 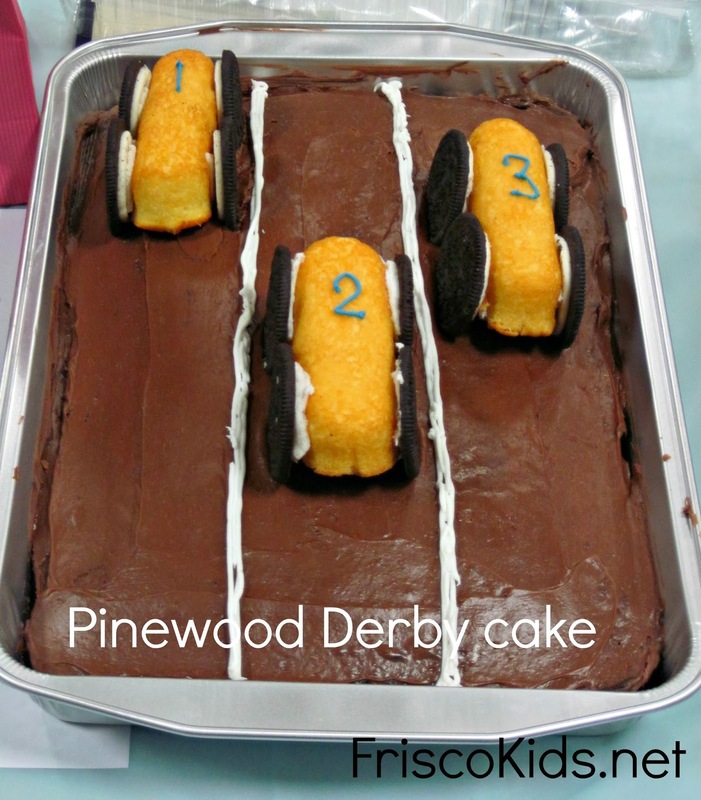 I thought we'd be the only Pinewood Derby cake, but there was another! Totally different concept, and cute. 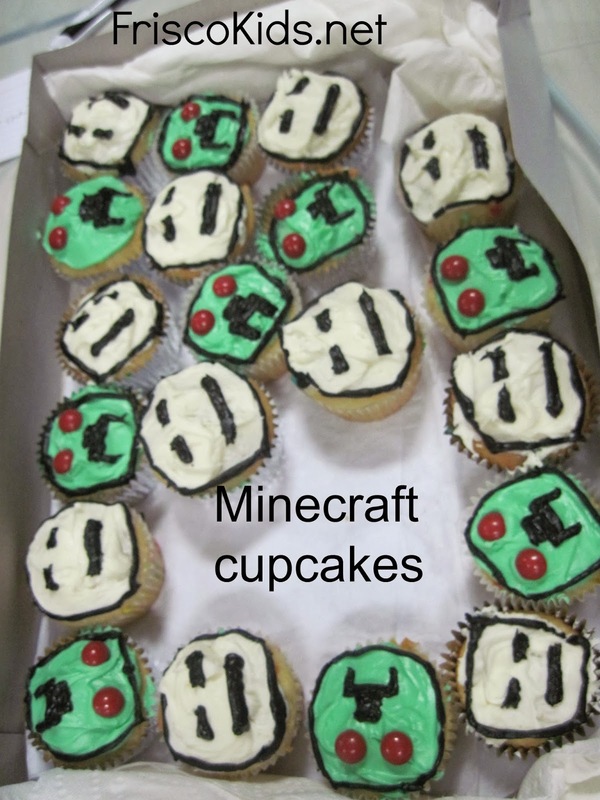 The second Minecraft entry, these cupcakes lasted only seconds.